Since I came to live in Oughterard 1967 there has been a reduction in the number of thatch houses. In 2012 I decided to photograph and record the history of the houses using thatch from Maam Cross to Gortreevagh. I was pleasantly surprised to find some fine examples of houses still using thatch. 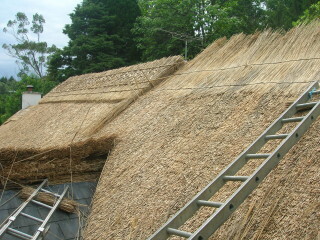 The decline is mainly due to the expense involved as thatching is labour intensive. It is often difficult to find ‘Thatchers’ – they continue to command respect wherever they ply their trade. Thatch houses are harder to insure because of the perceived risk that a stray spark could set the whole roof on fire. Birds in the past damaged a roof while they were foraging for grubs and rodents who were attracted by residual grain in the straw. Modern thatch houses do not have the problems of by gone days. 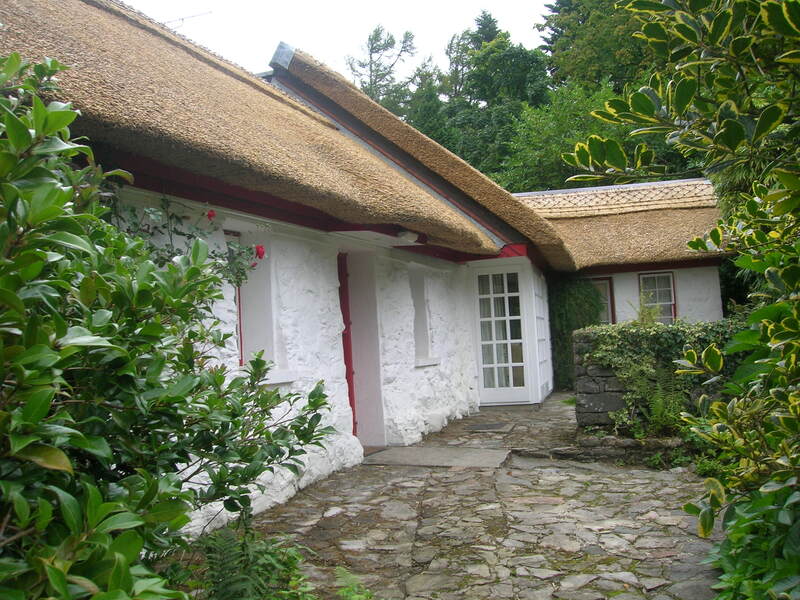 Thatching has evolved into an art form that is appreciated by all, and the Irish thatched cottage has become one of the features of our heritage that is most photographed and most loved. 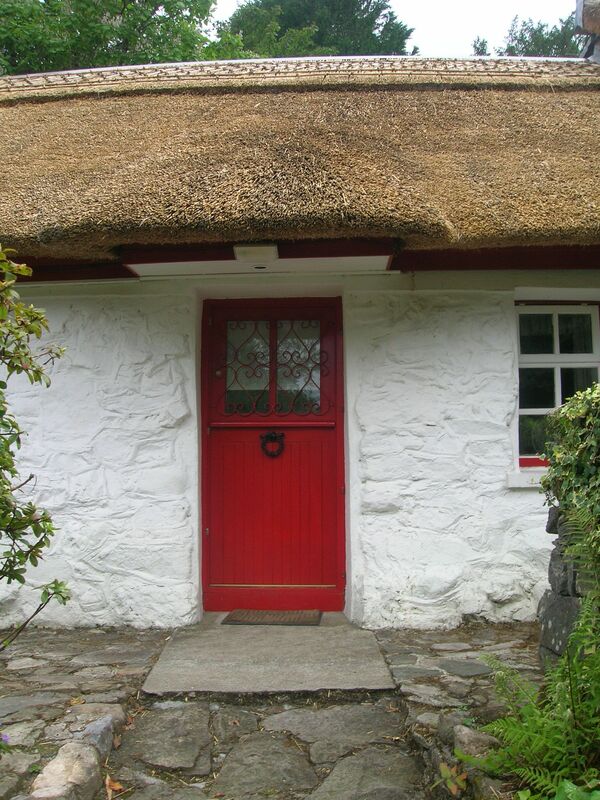 Irish Thatched Cottage Holidays have become popular in recent years as people from Ireland and overseas grasp the opportunity to experience just what it was like to live in a thatched Cottage. 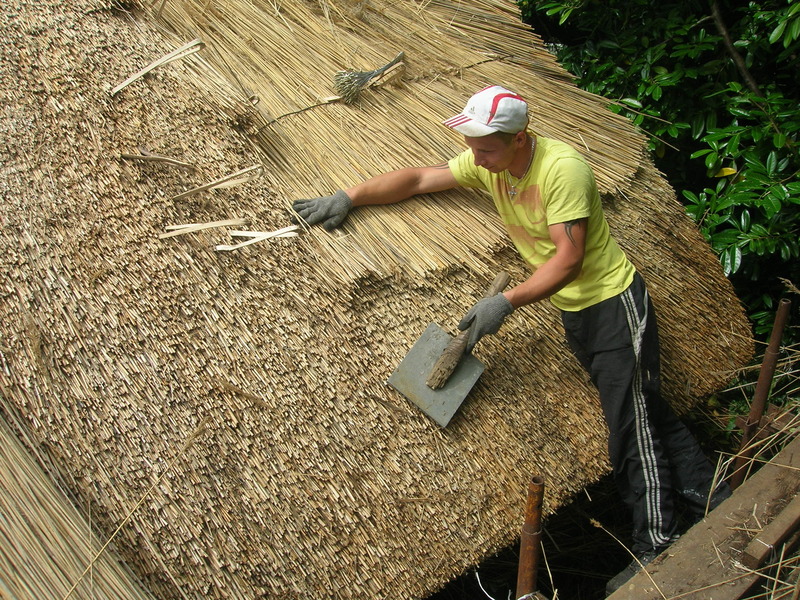 Thatching is the craft of building a roof with dry vegetation such as straw, water reed, sedge, rushes or heather, layering the vegetation so as to shed water away from the inner roof. Most homes in Ireland, in the countryside, towns and villages were thatched up until the 1800’s. From the 19th century onwards because of agricultural recession and rural depopulation the number of thatched cottages declined and the number of “Thatchers.” Later the number of thatched properties increased and was a symbol of wealth rather than poverty – people were interested in preserving historic buildings and using more sustainable building materials. The thatched rush houses of the 1870’s had two rooms and a loft. Often the gable end faced the road – people were not interested in having a scenic view, their main concern was shelter from the prevailing winds. The site for the house was carefully chosen taking account of the slope of the land, shelter and distance from other dwellings. The size of the cottages varied considerably – they were rectangular structures with thick stone walls mortared with clay or cement. Windows and doors were set in the long side of the house rather than in the gables. Windows were small and were deeply set in the walls. In the past some cottages had no windows at all as rent was often calculated by the landlords on the basis of the number and size of the windows. In fact small windows with even smaller panes of glass kept the house warm in the winter and pleasantly cool in the summer. Thatch was a natural insulator and air pockets within the straw thatch insulated a building in both warm and cold weather. Doors were set in the front and back of the house. One remained open by day, both as a means of ventilating the house and as a sign of welcome to callers. The front door was often divided in two horizontally and on windy days only the top half was opened to prevent draughts. The half door was also useful for keeping young children indoors and for preventing farm animals from entering. It also provided a comfortable armrest for the woman of the house when she lent out to chat with the neighbours. The roof was steeply pitched and its weight borne upon the walls. 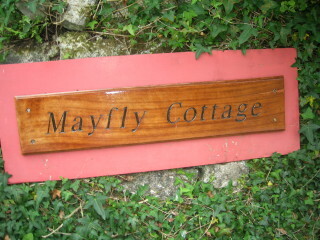 All cottages had an open hearth at floor level, with a chimney protruding through the roof ridge. The walls were usually covered with white wash which was renewed every year. 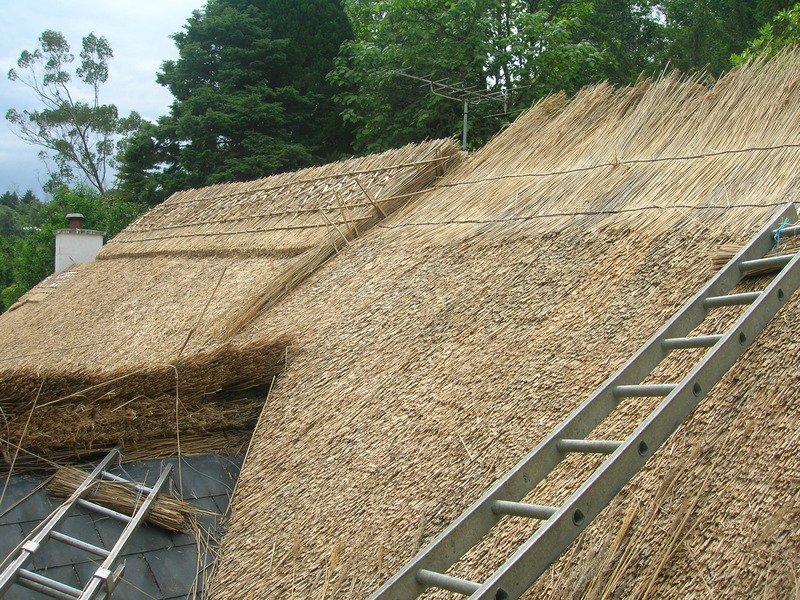 To keep the roof fully waterproof the thatch had to be repaired each year and whole thatch completely renewed after 7 or 8 years. In the early years it was a reasonably cheap way of roofing a house as the materials used, were available locally. The work of building a house was carried out in a cheerful atmosphere with neighbours and friends helping each other. When it was completed the owner would invite his helpers and neighbours to a house warming Céili which was an occasion for general celebration. Different methods of thatching were employed. Before a roof was thatched a thin layer of rough grass or heather sods was fixed over timbers and this formed a sound base for the thatch. Large families were reared in those small cottages and there was food enough – not elaborate – from the land to feed the hungry mouths. The farm grew fine crops of potatoes, turnips, barley and oats. A cow or two provided milk and butter. Emigration was rife and many emigrated to the United States and England, sending home money to assist their families. As people became prosperous they abandoned their thatch cottages and with the aid of a grant they built new homes with heavy squared rafters and slates, a spacious palour, kitchen with running water and electricity. The old thatched cottage was often turned into a cowshed. 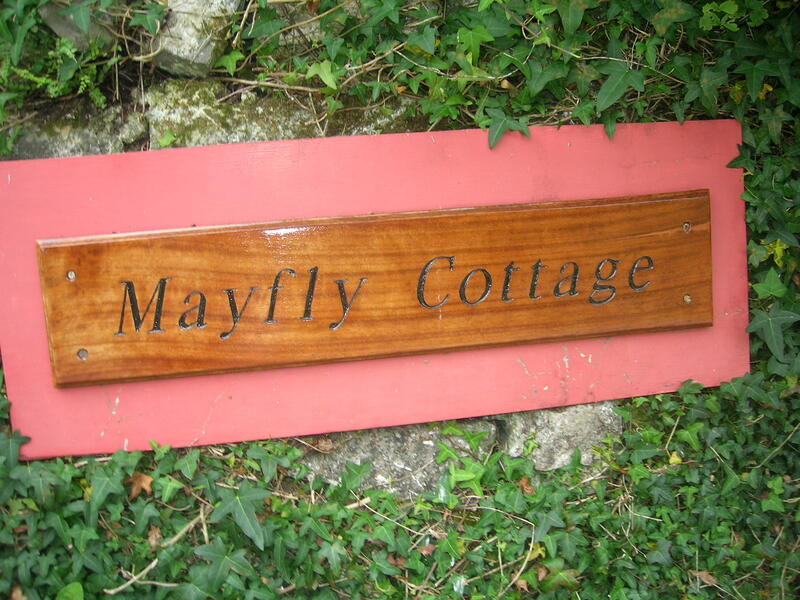 Whatever the merits or demerits of the thatch cottage they provided homes for large numbers of people over the centuries, and indeed still do. They sit comfortably among their surroundings in a way that their modern counterpart, the bungalow which has spread rapidly in Ireland during the past decades, never will. The cottage was to do with living, and its appearance was determined by the needs of the occupier, while bungalows were built with a jumble of materials and styles with cavalier disregard for the spirit of the place. Two storey thatch houses in Oughterard lined the lower part of the main street and Camp St with cottages interspersed between the tall buildings. Only two of the original thatch buildings now stand in the village – Powers Pub and Mary Joyce’s former home now owned by Gerry Gibney.